We are getting close to Thanksgiving, so it’s time to eat your heart out, or at least try a new recipe for the holiday season. This PecanPumpkin Butter Pie with Butterscotch Cream courtesy of WILLIAMS-SONOMA, will make him call you sweetheart after dessert and all month long. To make the pie, in a large bowl, gently whisk the eggs. Add the pecan pumpkin butter and evaporated milk and whisk until well combined. Pour the filling into the prebaked piecrust and bake until the center of the pie is just set, 1 to 1 1/4 hours. Check the crust after 30 minutes; if the edges begin to brown too quickly, cover them with aluminum foil. Transfer the pie to a wire rack and let cool for at least 2 hours before serving. If making in advance, cover the cooled pie with plastic wrap and refrigerate up to overnight. To make the butterscotch cream, in a heavy saucepan over medium heat, combine the brown sugar, corn syrup, butter and salt. Cook until the sugar has dissolved and the mixture starts to bubble, about 5 minutes; stir with a wooden spoon during the first 2 minutes of cooking (use pot holders to protect your hands), but do not stir after this point. Remove the pan from the heat and very carefully stir 1/2 cup of the cream into the hot syrup, then stir in the bourbon. Let the butterscotch sauce cool to room temperature. 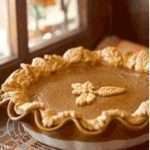 You will need 1/3 cup of the sauce for the butterscotch cream; reserve the remaining sauce to drizzle over the pie, or use as a topping for ice cream or cake. In the bowl of an electric mixer fitted with the whisk attachment, combine the remaining 1 cup cream and the 1/3 cup butterscotch sauce. Beat on high speed until stiff peaks form, 2 to 3 minutes. 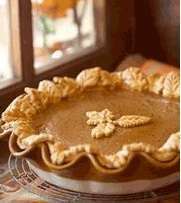 To serve, cut the pie into slices and serve with a dollop of the butterscotch cream. Serves 8 to 10.